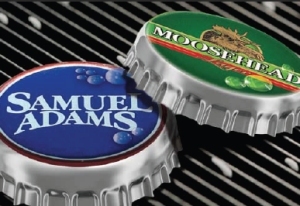 TORONTO, ON – At a news conference today in Toronto, Boston Beer Company Founder Jim Koch and Moosehead Breweries President Andrew Oland announced a five-year distribution agreement that will see Moosehead and its subsidiary, The Premium Beer Company, assuming Canadian distribution of Boston Beer’s portfolio including its flagship brand Samuel Adams Boston Lager. Previously distributed in Canada by Sleeman Breweries, Boston Lager will be available in all ten provinces via Moosehead/Premium, and will be offered in both bottles (355 ml) and kegs (30 and 58.6 litre). Popular seasonal beer Samuel Adams Summer Ale will follow this summer, also in bottles and kegs, with other seasonal offerings and variety packs being considered for future release. All Samuel Adams beer sold in Canada will continue to be brewed by Boston Beer in the United States. Moosehead Breweries and Boston Beer Company are the largest independent and fully domestically-owned brewing companies in Canada and the U.S. respectively, with Moosehead being owned by the Oland family since its founding in 1867. Can someone tell me how Moosehead’s distribution system actually works in Quebec. Does Moosehead warehouse the beer and truck it to all the independent retailers through out quebec? Do they use any 3rd parties for their distribution? I’m writing a case study for a marketing class. Thanks! My self and my entire pool team converted to moosehead beer about 4 years ago. Everything was great until recently. We’ purchased Moosehead everything we can from clocks,glasses, beer tap handles etc. I estimate we purchase about 3 to 5 cases a week and one keg every 2-3 weeks. Lately our new distrubutor has been stealing the promotions from your product. Such as hats and shirts and so on. We ve made complaints to them and nothing has been rectified. In the past month we counted over 15 cases these items have been removed. Thus we are taking this route first before switching to another brewery. We even have local bars supplying Moosehead at their establishments. We are trying to reach someone above them, for a resolution. 724-880-6977 or 724-438-7343 Grolsh is pretty good too. just a little more expensive. Thank you for your time and any info would be appreciated.